PLO secretary-general says Paris peace summit is a "significant step" on the path to peace, rejects Netanyahu's call for direct talks. Palestine Liberation Organization (PLO) secretary-general Saeb Erekat hailed Friday's international meeting on the Middle East peace process held in Paris as a "significant step" on the path to peace. "The Paris meeting is a very significant step and its message is clear: if Israel is allowed to continue its colonization and apartheid policies in occupied Palestine, the future will be for more extremism and bloodshed rather than for coexistence and peace," he said in a statement quoted by AFP. 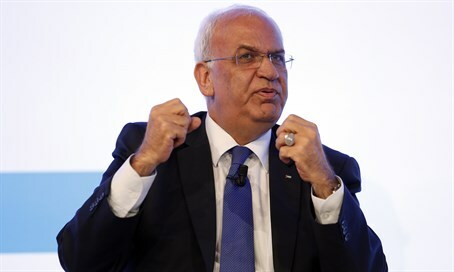 Erekat also rejected Israel’s call for direct talks between Israel and the Palestinian Authority (PA), saying Israel had failed to abide by previous commitments. "The multilateral approach of the French Initiative is needed in order to provide us with a clear mechanism of implementation and monitoring," he said. During Friday’s summit, which was not attended by Israeli or Palestinian Arab representatives, the international community committed to try and push Israel and the Palestinians to resume peace talks under a French-led initiative. At the meeting, representatives from 28 countries, the Arab League, European Union and United Nations discussed ways in which the international community could "help advance the prospects for peace, including by providing meaningful incentives to the parties to make peace," according to a joint statement. But PA foreign minister Riad al-Malki said the PA had "expected a better statement" to emerge from the Paris talks but was waiting to get more information from the French foreign ministry. Israel has rejected the French initiative. On Thursday, Foreign Ministry Director-General Dore Gold said the bid was doomed to failure, like a 1916 colonial effort to carve up the Middle East. "The only way to get a stable regional arrangement that will allow us to create real peace in the Middle East is if the parties of the region come to understandings between them," Gold said. "We believe the Arab states would give backing to direct negotiations between Israel and the Palestinians," he added. "Therefore we prefer a Middle Eastern process and not a process that somebody is trying to create in Paris." Prime Minister Binyamin Netanyahu on Friday reiterated Israel’s objection to the initiative as he spoke to French Foreign Minister Jean-Marc Ayrault. A diplomatic source said that Netanyahu reiterated Israel's positions on the issue and stressed that it would be better if France and its partners would encourage PA chairman Mahmoud Abbas to accept Netanyahu’s invitation to sit down for direct negotiations. Netanyahu also stressed in the conversation with Ayrault that the French peace initiative could harm regional efforts which have the potential to succeed.